In honor of the Academy Awards, I’ve decided to post a cocktail recipe. Instead of choosing a glam cocktail in some pretty glass, served up, or even a champagne-based cocktail, I went with a revamping of an old-school cocktail: the Old-Fashioned. This is inspired by the 2012 nominees for best actor. Each one seems to be proving that the days of the Hollywood gentleman are not dead, and that gentlemanly behavior is worth pursuing. Obviously, a gentleman deserves a gentleman’s drink and I can’t think of a cocktail that qualifies as such more than the Old-Fashioned. Given the super mild winter we’ve had this year, I thought that a brightening up of the Old-Fashioned would be in order – nodding both to the winter with the bourbon, but then also looking ahead to spring somehow. 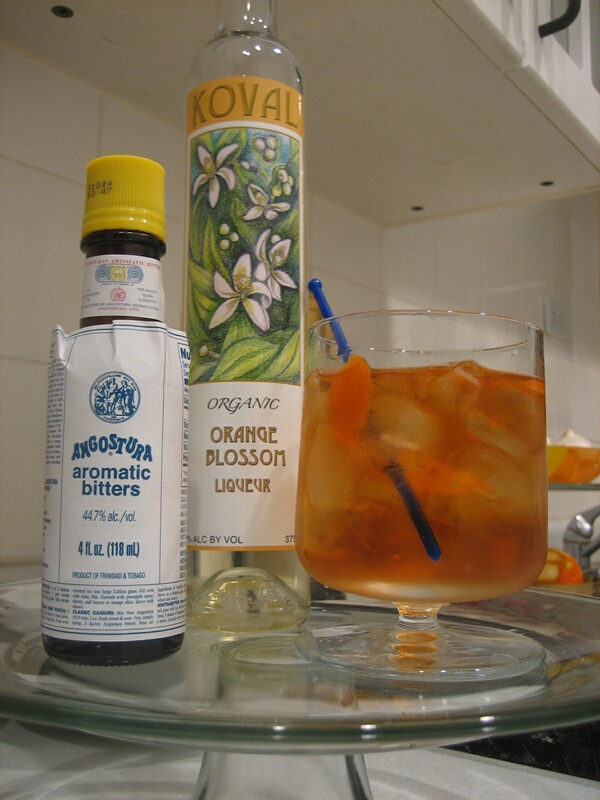 I bought some Orange Blossom Liqueur that’s made locally (http://www.koval-distillery.com/drink-buy/liqueur), so I decided to use that as the sugar component. For the most part, nothing else changes, except that I think ice and an orange peel are mandatory. Orange peel, squeezed over the top and added to the drink. I test drove this out on my friend Mark (a bourbon enthusiast) and he seemed pleased; he asked for another round. I advise you to sit back, turn on the red carpet show, and sip slowly. Enjoy.